I wish I lived in New York sometimes. Not for the weather or the people, but for the amazing nail art that takes place out there! Below is a wonderful opportunity for anyone near Brooklyn to see some truly astounding nail art, done by the supremely talented Ran Kowatari. Stop by if you have the chance! I've sent out some business cards and a few nail art samples that will be up at the reception as well. Arcilesi | Homberg Fine Art is pleased to present Beneath the Lacquer produced and curated by 2 Non Blondes, a collaboration by Ran Kowatari and David DuPuy. The show will consist of 12 digital prints ranging from 4x6" to 16x24". Elaborately bejeweled, ostentatiously painted nails, photographed in curious angles, Kowatari and Dupuy depict a compelling narrative in the day of a lesbian wedding. Kowatari's nail art pushes the boundaries of conventional beauty by furthering the story of each scene with symbolic interpretations of the bride's emotions throughout the day. Most of the photographs were shot in a Brooklyn loft, acting as the set of the bride's wedding chamber. Bridging the Gap over looks the Manhattan Bridge, expressing the transitional moment in her life, as she is about to enter marriage. The final shot was taken at a courthouse in Downtown Brooklyn. For more information and visuals, please contact Norma Homberg, Francesca Arcilesi, or 2NonBlondes. 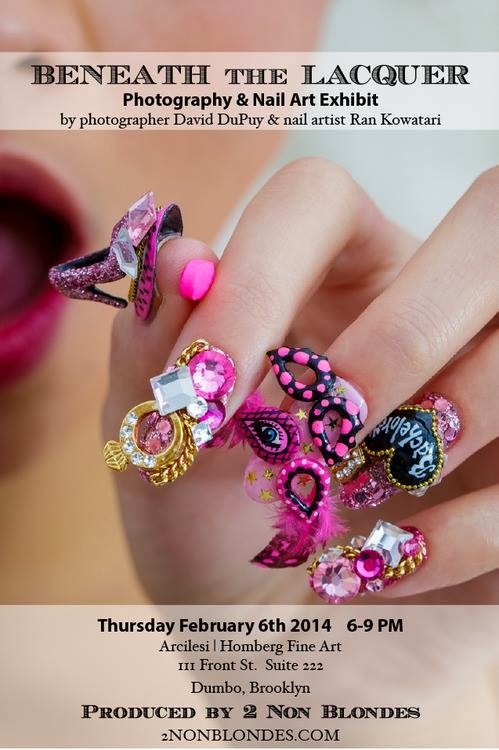 There will also be onsite nail art application on Thursday February 6, 2014 from 6:00-9:00pm.